Here is the perfect painting for the grinch in your life! Gunslinger, the rooster, has an unmistakable attitude that would make me hesitate to meet him in a dark alley. He is a great protector indeed. 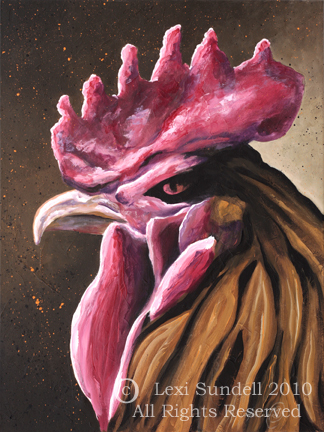 I had great fun painting this rooster study in acrylics on canvas. The piece is only 18” by 24” so it will fit nearly anywhere. At least anywhere you want a commanding presence in a small space. My artist husband said it has about as much oomph you can get in that size painting. Contact RiverStone Gallery for the original painting or limited edition giclee prints. This entry was posted in Art Paintings and tagged acrylic painting, grinch, gunslinger, rooster painting on December 9, 2010 by Lexi Sundell.